NEW YORK, NY--(Marketwire - January 24, 2011) - According to recent research by Great Jakes, one of the nation's top marketing communications companies serving law firms, between 56% and 75% of traffic on law firm websites occurs in the attorney bio sections. As recession-strapped firms push attorneys to develop business, it's become apparent that attorney bios are where prospective clients are turning first for decision-making information. Today, Great Jakes announced the launch of the first Rainmaker-Focused Website, which employs a next-generation approach to law firm websites. The Rainmaker-Focused Website revolutionizes the attorney bio section of websites. It is designed specifically for mid- and large-sized law firms. The first implementation of the Rainmaker-Focused Website was created for McManimon & Scotland, a Newark, New Jersey-based firm. The website launched today and can be viewed at http://www.mandslaw.com. "The legal marketplace has undergone a seismic shift since the beginning of the recession, but law firm websites have not kept up," said Robert Algeri, a founding partner at Great Jakes. "The Rainmaker-Focused Website gives law firms and lawyers the ability to truly distinguish themselves and attract the right clients." 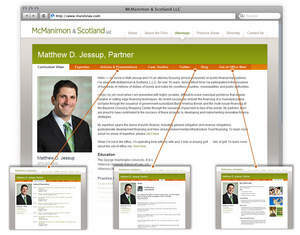 Attorney microsites are the center of the Rainmaker-Focused Website. These are multi-page attorney bio sections -- essentially, small, customizable websites for each attorney -- that fit seamlessly within the firm's larger website. An attorney's microsite can be configured to have any number or type of pages and accommodate virtually any type of content including text, photos, video, Twitter feeds, blogs or podcasts. This approach marks a significant departure from the single-page, "cookie-cutter" attorney bios found on most law firm websites. The Rainmaker-Focused Website is the culmination of over a year's worth of research and development by Great Jakes. Built on an open source framework, the Rainmaker-Focused Website was configured to easily manage hundreds of attorney and practice area microsites and allow clients to easily update, edit and share important content with clients and prospects alike. "Forward-thinking legal and professional services firms like McManimon & Scotland know that the value of their firm can be best expressed through the thought-leadership work of their attorneys," said Great Jakes Co-Founder Dion Algeri. "We are thrilled that they have enthusiastically embraced the Rainmaker-Focused Website." For more information about the Rainmaker-Focused Website, go to www.greatjakes.com. Great Jakes is one of the nation's top marketing communications companies focused on serving law firms and professional services firms. Founded in 2002 by brothers Dion and Robert Algeri, Great Jakes creates results-driven websites and web-marketing strategies. To get a taste of how they think, visit their blog www.greatjakes.com/blog or follow them on twitter at http://twitter.com/GreatJakes. To learn more, please visit www.greatjakes.com or call 212-699-3684. Great Jakes' groundbreaking Rainmaker-Focused Website leads prospects to the areas they need most.